Sorry - That is not the prize! As the promotion charge excites on the Bramall Lane pitch,one or two developments off the pitch have pleased me too. Firstly A United View reached 150,000 views - for which I am truly grateful. Secondly, my Blades related photo project Going to the Match - A Season at the Lane was selected as a featured gallery on the relaunch of critically acclaimed football website In Bed With Maradona. 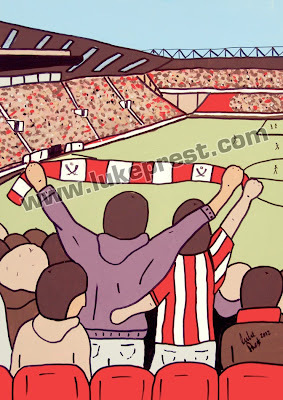 You can read why I started Going to the Match here, but the idea of capturing photos in and around going to each Blades game this season caught the attention of fellow Blades including a very creative one at that. 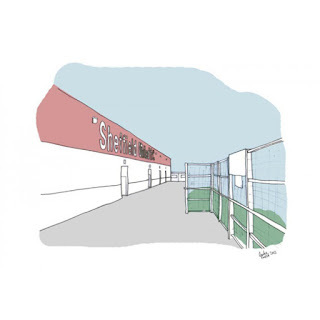 Talented local artist Luke Prest has painted pictures of Bramall Lane previously (see above) but the Going to the Match photos gave Luke the idea for the 'We Are Blades' print below and his new series 'A Day At The Lane' which is launched at Bramall Lane this weekend. You can read more about it in Luke's own words here. Thanks to Luke's generosity we have a 'We Are Blades' print as first prize in the latest A United View competition.Two Runners Up will each receive a set of 8 art cards from the Going to the Match collection of photos. The choice of which photos is entirely up to them. To have a chance of winning one of these prizes just answer the following question; either by emailing it to unitedview@gmail.com or tweeting the answer to @unitedite with the hashtag #AUVweareblades by Friday 15th March. Q: What was the biggest attendance on a day at the Lane in the 2011/12 league season?